Jane Cole (centre) with colleagues and stakeholders at the launch of the first ADL Palladiums. These were the first Enviro400 City buses for an operation outside of London. Posed with the iconic Tower in the background, the bespoke Blackpool Enviro400 City has a wrap around screen top and bottom for improved visibility. 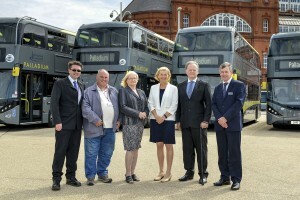 Blackpool Transport Services Ltd, the council owned municipal bus operation, has teamed up with Alexander Dennis Limited (ADL) in a unique deal that could change the way that operators purchase vehicles in the future. 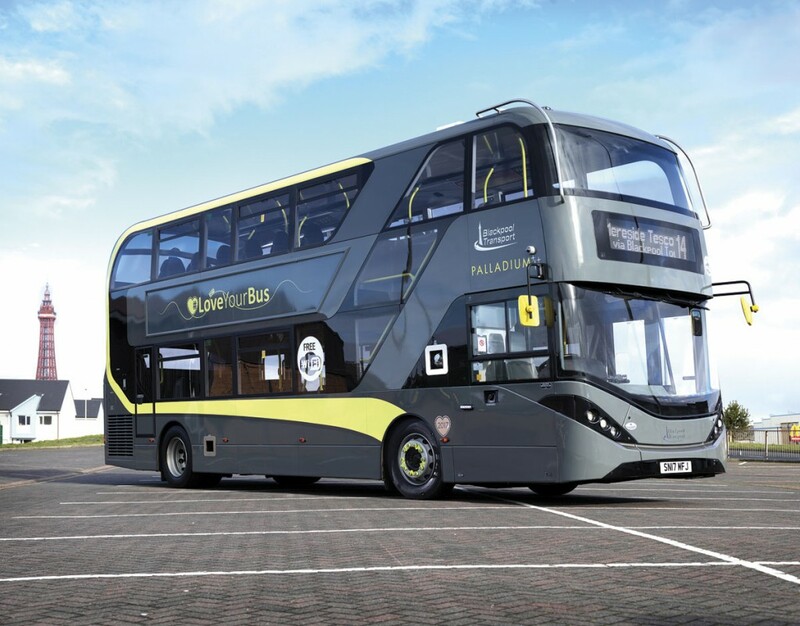 I first heard about this collaboration when Richard Matthews, Sales Director, Retail Bus at ADL, introduced me to James Carney, Finance and Commercial Director at Blackpool Transport Services Ltd (BTSL) at the CPT Annual Dinner. I was intrigued by the partnership and the vision that BTSL had for their future and I recently met up with Richard, James and BTSL MD, Jane Cole, to find out more about the operation and this somewhat bespoke collaboration. Over dinner at the Beach House Bistro on the Promenade, Jane told me about her five year plan, which she advised is a year ahead of schedule, and her achievements in the two and a half years since she joined the company. Providing sustainable, affordable transport solutions for residents of the fourth most deprived town in the UK and a visitor population of 17m a year, is not an easy task. Blackpool Transport is quite exclusive in that it not only operates buses, it also has a tram operation, as well as heritage bus and tram fleets. In 2012, the newly upgraded tramway re-opened with wheelchair accessible light rail trams (LRT’s) and one of Jane’s first jobs was to make sure the system was fully health and safety compliant…it is now. I asked Jane whether the tramway operation was a threat to the bus service? She explained that they are part of an integrated transport network and work in harmony with each other. The tramway runs for eleven miles along the coast to neighbouring Fleetwood and is popular with tourists and seasonal workers. During the October half term holidays and weekends during the illuminations, staff man the tram stops and through radio control, advise of passenger numbers and manage queuing. Bus services run alongside the tram route, should passengers prefer not to wait. This year they will acquire two new LRT’s which will take the fleet up to eighteen. The tramway is currently the number one attraction on Trip Advisor for Blackpool, if it didn’t exist, the buses would be heavily overcrowded and congestion in the town during peak times would be much worse. Jane had been advised that the heritage trams couldn’t run on the upgraded tracks and a visit to The National Tramway Museum in Crich, where she saw some of the old Blackpool trams running, made her think, ‘These should be in operation in Blackpool.’ The Heritage fleet now operates 52 weeks of the year, run by a pool of 60 volunteers. It has applied for charitable funding to remove the risk from BTSL and this should be attained in 2019. With approximately 600 staff, plus seasonal workers, the company is a significant employer in the town although the NHS is the largest employer. Jane commented that the staff understand that the profit that they help to generate (last year, it was £1m) goes back to the council, which helps to provide the services for them that they need, use and care about. There is a customer experience team in place that responds to every passenger comment and complaint. They will then analyse all of the data available to them and provide feedback. If the complaint is found to be unfounded, they ensure that the driver receives an apology on behalf of the company. This is such an obvious thing to do and I don’t know if it happens elsewhere. If it does, nobody has told me about it before, but such a small gesture will undoubtedly make the driver feel valued. Jane has an open door policy and employees are actively encouraged to discuss their thoughts and ideas. An incentive scheme has been introduced whereby ideas that are implemented reward the employee with a £25 voucher. Staff loyalty is high, but many drivers said in a staff survey that they would not recommend becoming an employee. Some of this can be attributed to a pay structure that was introduced in 2012 where pay increases were awarded for long service. Jane is working with the union to address this but pointed out that BTSL are a Joseph Rowntree Foundation guidelines pay employer, which means they pay well above the minimum wage. With an older passenger demographic, particularly from tourists, and 20% of the population having hidden disabilities, improving the customer experience for this sector is something that BTSL have fully embraced. Working with community disability and dementia groups, they have trialled a version of their forthcoming App which has ticketing, timetabling and real time information, to test how they can get to and from two distinctive landmarks. The App has been gifted to them for use as an ongoing simulation and training tool. BTSL have hosted stands at local hospitals and organised a trial for newly disabled passengers with wheelchairs to use the bus. They were asked to feedback how easy it was to board and their overall experience. Penny Mordaunt MP, Disabilities Minister, has appointed Jane as Bus Sector Champion, a position she is obviously delighted with. With Thamesdown Transport recently being sold by its Swindon Council owner, I was interested to see what the relationship was like between the client and the stakeholder. Jane told me that trust had to be rebuilt. One of the problems that she faced was that the board had been solely made up of Councillors. Jane persuaded the Shareholder to change this and the board now includes a transport consultant from PBA Associates, the Marketing Director for Merlin Group (The entertainments company, responsible for local attractions such as The Tower and Madame Tussaud’s) and a disability expert. Next year will see the electrification of the railway line from Preston to Blackpool, which is due to be completed in May. To coincide with this, Blackpool Council have applied for an extension to the tramway to a terminus at the railway station. This will help form the integrated transport model that is part of Jane and BTSL’s vision. It was therefore imperative that the bus operation offered the same high quality service so that passengers could enjoy seamless travel throughout the area. 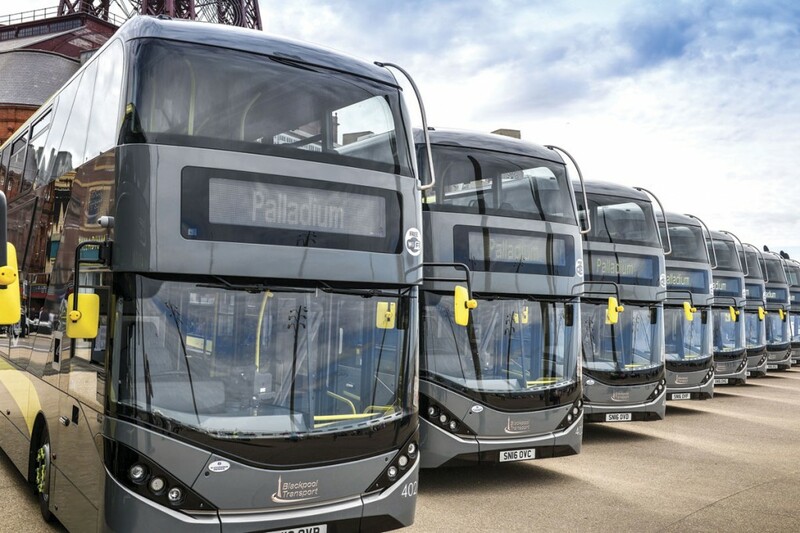 This was where Palladium was born, a sleek collection of luxury buses with E-leather seating, wood effect flooring, free WiFi, mobile charging points and next stop announcements, complimented by a contemporary metallic livery, designed by Buzz Marketing. James explained to me that when he joined the team, eighteen months ago, there was a realisation that the fleet (excluding the heritage vehicles) was so aged, with the oldest vehicle being 14 years old. More frighteningly, by 2019, 75% of the fleet would be time served. This presented a huge challenge and to replace this number of vehicles required significant investment from the shareholder. He convinced Jane that, with interest rates at the lowest they have been in many years and central Government encouraging LA’s to apply for a number of funds that were available, now seemed a good time to engage with the stakeholder. James explained that they were both working for the good of the local community and that their joint aim was to provide both visitors and Blackpool’s residents with the best possible transport system, commenting that the residents deserved the same high quality transportation system as that enjoyed by tourists. He presented data to the council showing the average spend on a current bus over five years, against the depreciation of a new vehicle, and by applying for LCEB (Low Carbon Emission Bus) funding, the deficit could be achieved by implementing a fare increase of 3%, or increasing passenger growth by the same percentage. It’s worth noting that LCEB funding, or something similar, would be needed each year of the five year vehicle renewal programme, in order for the plan to be financially viable. A fare increase is never well received, particularly in a deprived area, but the justification came from the assumption that passengers would appreciate the new vehicles and the extra facilities that would be provided on board. This appears to be the case as graffiti and vandalism has decreased and such was their success, despite the fare increase, income growth has outperformed the rest of the operation, evidence that customers would pay for a premium product. The Council’s Director of Resources was sold on the idea and they agreed a five year renewal scheme, replacing one fifth of the fleet per year. James saw this as a great opportunity to down size the fleet and began by removing the majority of the midi range vehicles as Blackpool is a fully urban operation, making those sized buses pretty much obsolete. The aim was to purchase 135 vehicles, a reduction of up to eight buses overall. In 2015 ten Mercedes-Benz Citaros arrived, branded in the new Palladium style. These were very well received, particularly for their smart appearance. At the same time, nine Volvos with Plaxton Centro bodywork were refurbished by Lancashire based Bus and Coach World and rebranded to Palladium. The rest of the fleet was deemed too old for economic refurbishment. The offside of the Blackpool Enviro400 City with McKenna Brothers destination equipment. The company decided to look for a manufacturing partner that could work with them over the next five years, but there was a proviso, they had to buy into an extended warranty deal of five years. Immediately, a number of manufacturers were eliminated because they did not produce LCEB standard vehicles. BTSL were rightly cautious whether there would be enough interested parties. Not because they thought their plan couldn’t be realised but, although there was a potential vehicle order of 125 buses, they couldn’t commit a contract that offered the full complement at one time and compared to the buying power of ‘the big five’, they considered themselves small fish in a big sea. Having seen the original Palladiums, Richard recommended the Enviro400 Euro6 model to the company but the package wasn’t right. It was then than the discussion turned to the Enviro400 City bus which, until that point, had been designed specifically for the London market and had not been made available outside of the capital. This meant redesigning the vehicle to remove the central doors, based solely on an order of ten vehicles, with a potential of 115 more. If they were to go into partnership, the entire relationship had to be built on trust as the risk on both sides was considerable. As is now well documented, the single door Enviro400 City has not only been well received in Blackpool, it is also resulting in sales for ADL to other operators such as Nottingham City Transport and Plymouth Citybus. Of course, one could not expect that setting up this partnership was as simple as I may have portrayed. It was down to the efforts and contribution of a great many people on both sides, including finance, commercial and engineering, that all bought in to the visionary concept. James explained that he had always wanted to transfer the responsibility of reliability back to the manufacturer and one of the key areas for concern was servicing and parts. James wanted a five year, bumper to bumper extended warranty that included all OEM parts. He explained, ‘A bus is a mechanical thing that at some point is going to break down. We didn’t want that risk to be with BTSL.’ At the time, Richard Jackson was the Parts Technical Director for ADL and he was instrumental in brokering the deal to increase the warranty from three to five years for a small percentage increase. Additionally, BTSL agreed to pay a fixed sum over sixty months for parts. This meant that each of the Palladiums would be on the same parts contracts and each batch would be on the same price structure, allowing for potential increases in manufacturing costs. The opinion of drivers was just as important to the ADL and BTSL team as that of the management and engineering department. 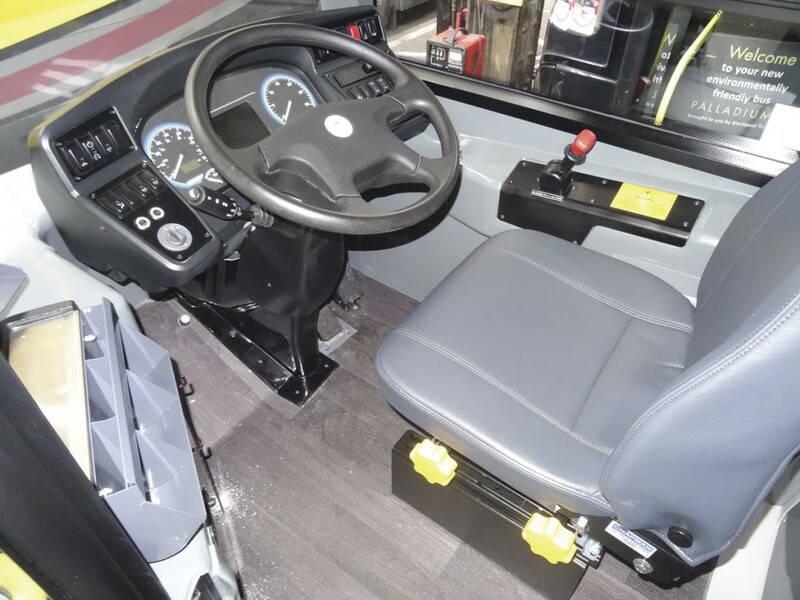 For example, the cab door was altered and the seat from Chapman Driver Seating was tested for comfort. BTSL now have imprest stock in place and online ordering that links directly to the ADL network. Although housing the parts was initially problematic, the benefits of having everything in house will make a huge difference to VOR times and James advised that the accounts team, previous to this partnership model, were processing some 500 orders a month! Richard Matthews suggested that most parts were available next day, but up to three days was sometimes the case and the company’s pick rate was in the high nineties. This was much more agreeable to BTSL who had experienced waiting several weeks for parts from suppliers in the past. The fact that ADL was essentially a British manufacturer, was another of their strengths. Aftersales is something ADL feel strongly about and so they have guaranteed the vehicles are delivered ‘fit to run’. It’s a world away from the ancient practice of treating the delivery drive as an opportunity to put together a snagging list so that they can then iron out any niggles! If the five year ‘all in’ parts and servicing deal wasn’t a big enough ask already, James also wanted a contractual agreement on expected MPG. A number of the manufacturers approached were able to quote convincing figures, but when asked to put it in writing, they were reluctant to do so. ADL were the only ones confident enough in their product to do this, having already been tracking their vehicles in service in London. The agreement is such, that if the operator does not achieve the MPG quoted, then the manufacturer will compensate them. Again, another huge risk on the part of ADL and a brave request from BTSL. I asked Richard how he would know if the poor result had been down to bad driving, say from excessive idling and he assured me that there were telematics systems in place that would report this and any other areas that would require driver training, using the popular traffic light system. Richard intimated that ADL have invested in an exciting new online fleet management and diagnostics system that is due to be fully launched later in the year. Initially, BTSL will be trialling it alongside a couple of other operators and I will be covering this in a future article in Bus and Coach Buyer. I questioned whether this new way of managing vehicles may make some of BTSL’s engineers surplus to requirements and James assured me that there would be no forced redundancies. There was mixed reaction from the engineering team, the positive being that they were no longer having to keep an old fleet going, but a concern that there may not be enough work for them. Therefore, it was important to both the manufacturer and the operator that everyone was on board with the new concept. James commented that the engineers would be moving from preservation to preventative maintenance and it was a great opportunity for them to achieve a whole new skill set. The burning question was, what will happen to the vehicles after five years? This is still a point for discussion between both parties. With the vehicles not to London specification, possessing a full service history using OEM parts and having been operated in an area that isn’t hilly or with excessive tight bends and not run 24 hours a day, one could expect them to have a high residual value. In fact, it could be fair to say that the depreciation could be considerably less than what would have been the five year maintenance costs of operating an old fleet. A new Palladium route is being launched in April along with the next batch of twenty five Enviro400 City vehicles and I will cover the vehicle specifics in the report on that event. Due to a pending contract beginning in November, which had Palladium standard vehicles specified in the tender process, a further fifteen vehicles will be delivered in October to support this. I have to say, I’m very impressed by the visionary way both parties have come together to this outcome. This ‘marriage’ is clearly in its honeymoon period and it will be interesting to see whether it will be a match made in heaven. It certainly made me wonder whether this model is the future in terms of vehicle purchasing, but one has to remember that this is an entire fleet upgrade and the opportunities of this happening elsewhere within the industry I suspect, must be quite slim. That said, it could be something that the larger operators could implement. I also think that the relationships between the operator, the council and the manufacturer has been key in making this work. The calculations have been misjudged creating huge unforeseen costs for either party? There is also the question about what happens when the five year agreement is up. Do BTSL sell these vehicles and purchase more under the same or similar terms? It’s certainly a very interesting partnership and one I will be following avidly.